Homemade Chocolate Cream Pie made with dark chocolate, fresh cream, and an Oreo cookie crust. 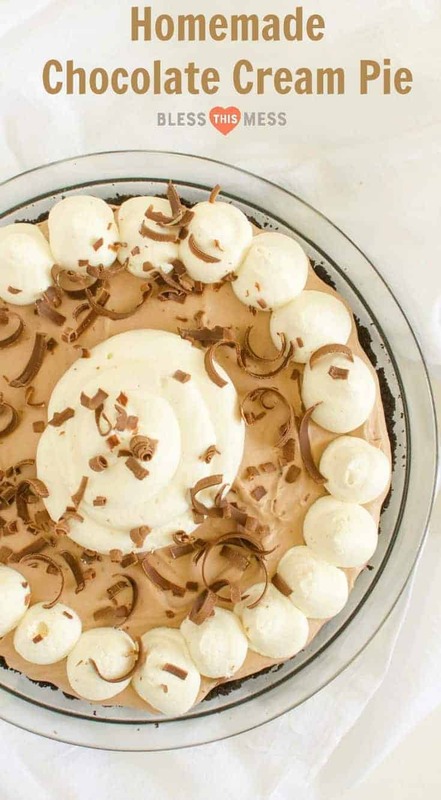 Chocolate and fresh cream – what more do we need? I love making homemade puddings, and they are so much easier than you think. For this recipe, you simply make a homemade pudding with some eggs, milk, and sugar and when it’s done, you stir in chocolate chips to melt and make it chocolate pudding. You can put all the pudding on the bottom of the pie and all of the cream on the top, or do a little mixing and layering like I did here – it’s totally up to you. This is a simple pie that is a lot of fun to make and feels a little bit fancy with chocolate curls on top (I just use a vegetable peeler down the side of a chocolate bar to make the curls). This is one of my family’s favorite pies, and you don’t even have to roll out a pie crust. After writing a huge post all about pie crust recipes, I wanted to share a few classic, simple, perfect-for-every-holiday pie recipes to go with it. 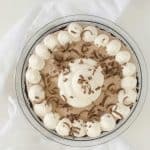 You need something delicious to fill your favorite pie crust and this post is just that – delicious Homemade Chocolate Cream Pie to go inside your favorite Oreo cookie crust. There’s something magical about serving a homemade pie after dinner. It just says love. It seems to take you back to a time when life was simpler and homemade pie was standard fare in American kitchens. Today, amidst the hustle and bustle of everyday life, taking time to make pie is almost therapeutic. It’s a slower process than opening a box of brownie mix, but there’s so much satisfaction in it. Plan to take an afternoon to bake and you just might love how grounding the whole process is for you. And you’ll have a beautiful pie to enjoy after dinner or to share with friends, and that’s a pretty great reward, too. 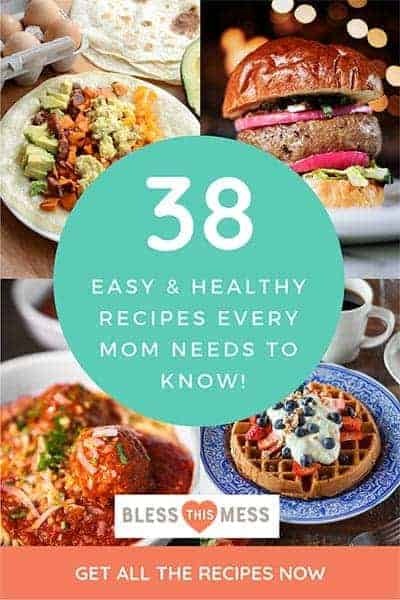 Looking for other great pie recipes? You can check out my post on 8 different pie recipes (including all the classics like cherry pie, apple pie, pecan, and more!) if you need a little more inspiration. Don’t feel like you need a thermometer to hit the right temperature for the cream and sugar if you don’t have one. The goal is to get it nice and hot (steam will start coming off of it) without boiling it. You’ll see when you get there – it’s pretty straight forward! 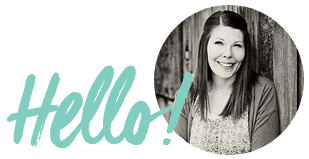 My husband loves, loves, loves this pie and I like that it’s pretty easy to put together. Not a lover of typical fruit or pumpkin pies? This pie is for you! You can change up the flavor by using different chocolate! I’ve made white chocolate peppermint pies in the same manner using peppermint chips. It was awesome. You can sweeten the whipped cream before you add it to the top or not. We prefer it sweetened with a little powdered sugar and flavored with a little vanilla. In a large saucepan, bring the cream and 1/4 cup of sugar up to 180 degrees over medium heat, stirring very often. The mixture should be hot and start to steam across the top but should not boil. While the cream is heating, mix the cornstarch and 1/4 cup of sugar together in a medium bowl. Add the egg yolks and whole egg to the cornstarch mixture and whisk to combine well. When the milk is hot, slowly whisk one cup of hot milk into the egg mixture and then whisk the egg mixture back into the pan of hot cream. Cook over medium heat until the mixture starts to bubble and thicken, stirring constantly, about 6 minutes. Remove from the heat and stir in the chocolate chips, butter, and vanilla. Cover the pan and refrigerate until cool (this will take 2-4 hours). When the chocolate pudding is cool and you are ready to assemble your pie, whip your heavy cream. Place half of the chocolate pudding in the bottom of the pie crust and spread it out evenly. Mix half of the whipped cream into the other half of the chocolate pudding and fold it together until the chocolate pudding is lighter in color and fluffy. 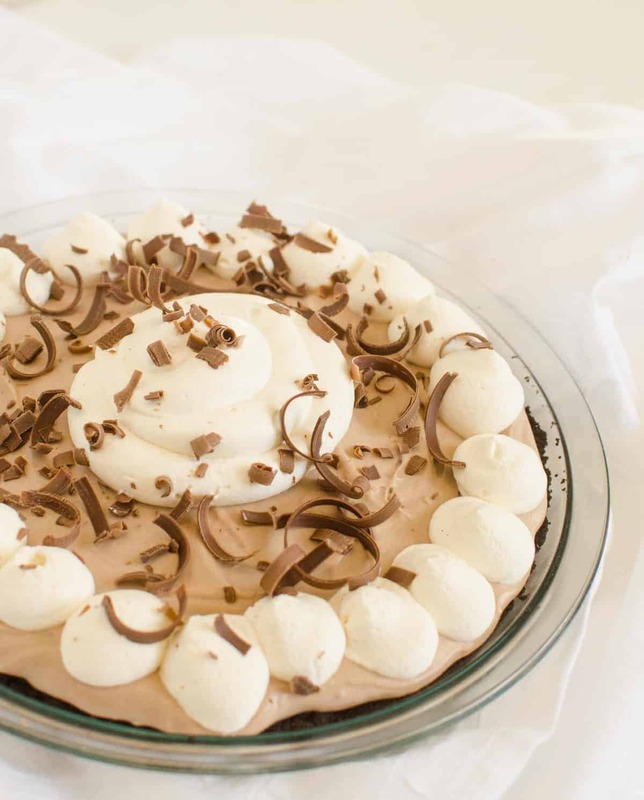 Add this chocolate and cream mixture to your prepared crust over the plain chocolate pudding and spread it around. Add the remaining whipped cream to the top of the pie (you can spread it or pipe it out) and then top with chocolate curls. To make chocolate curls, simply use a vegetable peeler down the side of a chocolate bar. Happy pie making from my kitchen to yours! 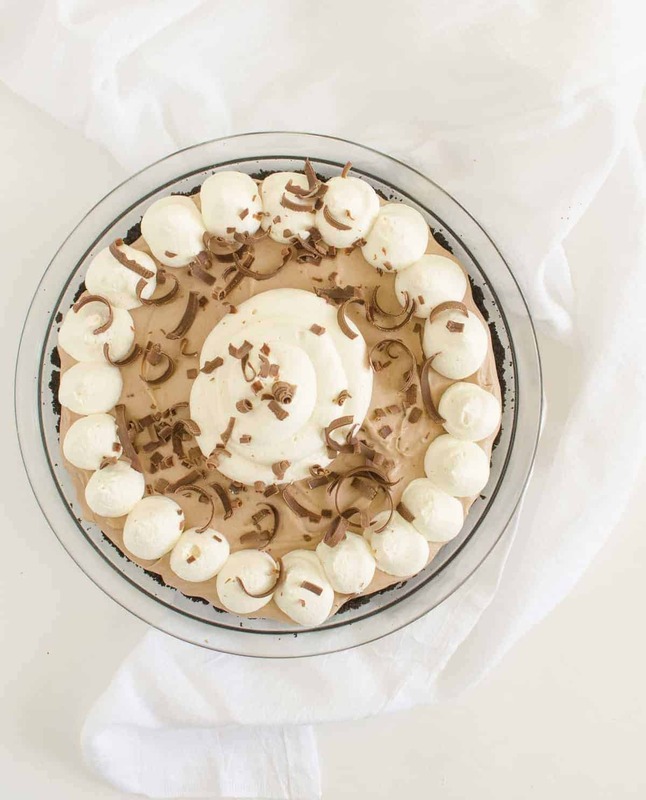 You are going to love making this simple homemade chocolate cream pie over and over again. You had me at chocolate. This looks and sounds divine and I’m so glad I found it because I was looking for a good chocolate dessert for Christmas. I think I found it. Thanks!